The most exciting thing about his tart is the base – I used pretty much a standard shortcrust pastry (200g plain flour, 100g cold butter, one egg, a splash of water, a dash of lemon juice, and tablespoon of sugar and a pinch of sea salt) but I substituted a handful of flour for a handful of crushed brand flakes. Genius. It makes the crunchiest base you can imagine. While blind baking the base, I made the filling – a thrown together version of a frangipane with 100g of butter creamed into 100g caster sugar and then beaten together with two eggs and finally folded into 100g of ground almonds. Drop the frangipane into the now cool pastry base and layer sliced apple over the top, hopefully in a much neater pattern than I managed. I’d go for two layers, which will require about three apples. Don’t bother peeling them. Now sprinkle dark brown sugar over the tart and stick it in the oven at 180c for 30 minutes. Take it out. Let it cool. Eat it. Preferably with a glass of Sauternes. 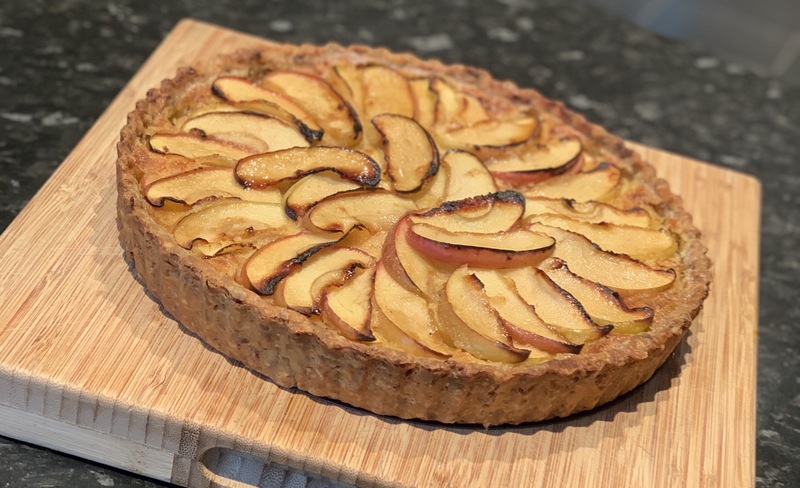 This entry was posted in Sweet things and tagged Apple, pastry, Shortcrust, tart on March 17, 2019 by Jonny Kaldor.